Some microorganisms like Giardia are protected by a hard outer coat. Chlorine has little effect on them. 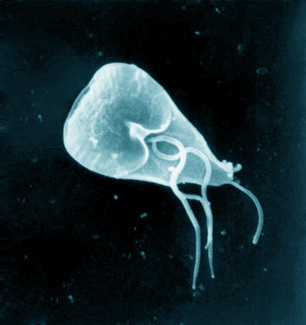 Giardia lamblia, also known as Giardia inestinalis, is a single-celled protozoan and intestinal parasite. It is found world-wide, in the feces of infected animals and humans, and on the surface of uncooked contaminated foods. In water, it can be found in natural water supplies, hot tubs, swimming pools, water parks, and ice. It exits in two forms: as a cyst, as small as 7 microns, with a highly resistant “shell” that allows it to live outside the body, and as a trophozite, a tear-drop shaped parasite that emerges as a result of the shell breaking down in the stomach. The trophozite attaches to the intestinal wall. In this form, it cannot live long outside the human body. Giardia is the cause of Giardiasis, also called “beaver fever” or “traveler’s diarrhea.” One to two weeks after becoming infected, symptoms of diarrhea, abdominal distension and nausea may develop, leading to potential weight loss and dehydration. Though typically not a major health concern, Giardia can be life-threatening to infants and those with compromised immune systems. Any filter with a size of 1 micron or below, including ultrafiltration and tight carbon block filters, will be an effective treatment. Ultraviolet is very effective, as are reverse osmosis and ozone. Although regular chlorination is not an effective treatment, shock chlorination can be used.